State Sen. Randy Brogdon said he was extremely concerned about this weeks take over of Tulsa-based Williams Cos. Gas compression facilities by a Venezuelan government-controlled company. He also said there are direct parallels between that action and U.S. government bailouts and takeovers of American companies. But Brogdon said Oklahomans and citizens throughout the country should be concerned that their own government is moving to take over private businesses as well. Brogdon said thats why hes sponsored legislation to stop Washington D.C.s power grab, and to prevent Congress from violating the 10th amendment and states rights. That legislation was approved by both the House and Senate, but was vetoed by Gov. Brad Henry. 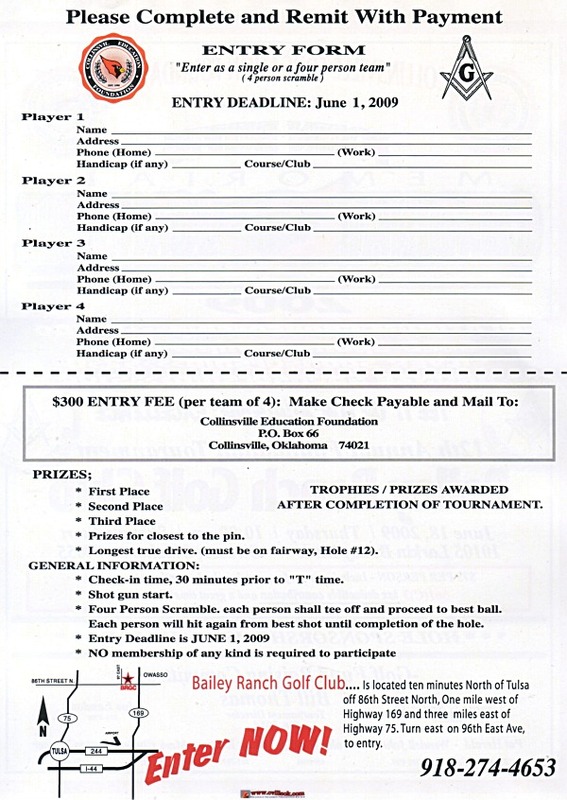 The Collinsville Education Foundation will be hosting the annual John Butts Memorial Golf Tournament on June 18, 2009 at Bailey Ranch Golf Facility in Owasso. This is the largest fund raising event we have to provide help for the children of Collinsville Public Schools. Because of your generosity and interest in the education of our students, the CEF has been able to award more than $125,000 in grants to the teachers in the Collinsville school system over the past several years. Also, an annual $1,000 scholarship is made available to an outstanding Senior for their college tuition. The enclosed player entry form is for you and others who support this 2009 event. 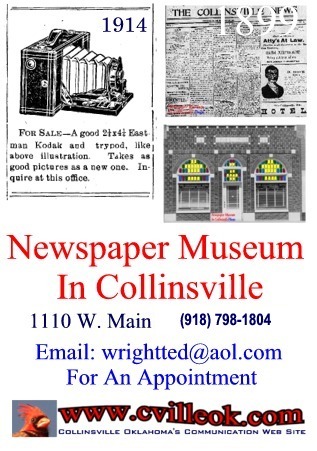 You may leave this form at any one of the three banks in Collinsville (Bank of the Lakes, American Bank, or RCB Bank) or you can mail your support check to C.E.F., Box 66, Collinsville, OK 74021. As one of our trustee put it -- "it's all for the kids", so please be generous this year!! On behalf of the trustees and children of Collinsvile we thank you. Children & Teens will be getting creative and expressing themselves at the library when the Summer Reading Program begins officially on Mon., May 18! Children who visit the library 4 times and read or listen to 8 books will earn a medal and a coupon book for free food & entertainment. Children who read or listen to 12 more books for a total of 20 will earn this years bonus prize  an inflatable crayon. 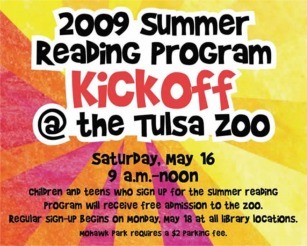 Teens who read or listen to 6 books will earn a journal with coupons for free food & entertainment. Both Children & Teens will be entered into grand prize drawings when they complete the program. The SRP will wrap-up with Library SRP Night at Drillers Stadium on Fri., July 31, 7:05 pm. Summer Reading Program Challenge....we have been challenged by Sand Spring Mayor Bob to beat his summer reading numbers...our Teen Team will be at the City Commission Meeting on May 18 with yard signs and information about the program as the Commissioners and Mayor Sallee are a vital ingredient in our campaign to beat Sand Springs! We are going all out to beat that challenge with Mayor Stan cheering us on...please let neighbors, children, babysitters, aunt uncles, grandchildren, children visiting for several weeks this summer ... all know about our fabulous summer reading program, our entertaining programs and prizes for children and teens. Don't let Sand Springs Mess With Collinsville! Also if you need a library card we are working on updating and issuing library cards to everyone in the Collinsville area...we especially want every student to have a library card... and all newcomers to Collinsville.